The Rev. Andres (Andele) Martinez and J. J. Methvin (The Rev. 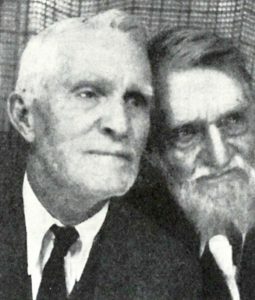 John Jasper) were described as “fast friends and Christian workers for more than 40 years” by author and fellow missionary, Robert Satterfield. Andres Martinez and his Kiowa kinsman, Kicking Bird, are credited, along with missionary the Rev. John. J. Methvin, with bringing southern Methodism to the Kiowas. Both converted to Christianity and became native pastors, but each also continued participating in their Kiowa cultural and spiritual practices, according to Tash Smith. The Martinez family, from Spain, lived among Mexican families that settled in Las Vegas, New Mexico. Don Juan Martinez, Andres’ father, was a rancher. When Andres was a boy, he and his 4-year-old nephew, Pedro, were sent out to watch the cows while the rest of the family and hands brought in the wheat at threshing time. But the boys were not heard from again. They were picked up by a Mescalero Apache band, tied to warriors, and carried off as slaves. Pedro did not survive the trip, but Andres made it back to the Apache encampment where he was severely abused for four months. But then the Apaches sold him to a Kiowa chief, Heap O’ Bears. Heap O’ Bears’ daughter, Hon-Zip-Fa, had lost a son and adopted Andres as her own, and Heap O’ Bears served as his father. They called him Andele because they could not pronounce his Spanish name. Andele thrived in his new home, learning the Kiowa language and spiritual and cultural practices. He grew up to become a good warrior and a favorite son. But after Heap O’ Bears was killed by neighboring Ute raiders, Andele went to work for the U. S. government as a blacksmith. At this point, he discovered he could reconnect with his original family. After several tries, he contacted Dionicio, his brother, and he returned home to meet his mother, whom he had not seen for 20 years. His father had died just three years after Andres disappearance. Andele could not adjust to life among Americans and Mexicans and in 1889, he returned to Kiowa country in Oklahoma. After arriving in Oklahoma, he met the Rev. John Jasper Methvin, assigned by the Methodist Episcopal Church, South, as a missionary to the Indian Missionary Conference. Methvin had difficulty making headway with the Kiowas in Anandarko. His first Kiowa assistant, Etayle, who had returned from the Indian School in Carlisle, Pennsylvania, had died suddenly, and the Kiowa attributed his death to the fact that he was helping the missionary. According to Methvin, he first encountered Andres by a river bank and invited him to a church service. Andres replied: “I am not a stranger here. I have been away, but this is my home.” Methvin and Martinez became and remained close friends for the next 40 years. Andele served as Methvin’s interpreter. It was Andele who convinced Kicking Bird to accept Christ. Many of the Kiowa became Methodists through their work. After the Methvin Institute was established, Martinez taught industrial arts there and married its matron, Emma Wharton, the daughter of a Methodist pastor. They did not have children of their own, but adopted two Kiowa girls. Eventually, Martinez was ordained in the MECS and oversaw the Indian churches in Oklahoma. He died in 1935. Compiled by Christie R. House, editor, New World Outlook magazine. “Andele, Mexican Indian, Christian Minister,” by Robert S. Satterfield, World Outlook, June 1936. “The Kiowa Captive,” by Betty Burleigh Scudder, World Outlook, January 1945. Andele, the Mexican-Kiowa Captive, by J. J. Methvin, 1899. Capture These Indians for the Lord: Indians, Methodists, and Oklahomans, 1844-1939, by Tash Smith, University of Arizona Press, 2014.